Come enjoy a wonderful event! 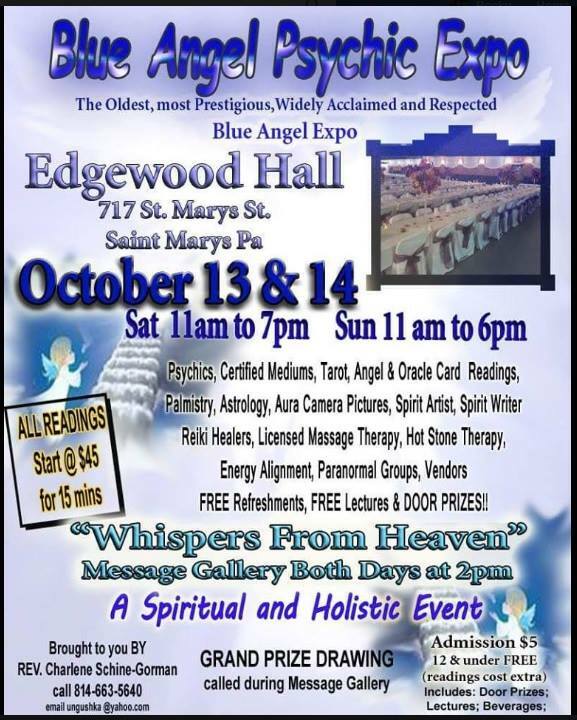 The Blue Angel Holistic/Psychic Expo at the Edgewood Social Hall in St Marys, PA! Free lectures, free refreshments, beautiful door prizes, colored tv grand prize. 2pm message gallery! The best mediums, psychics, healers. Awesome vendors. Enjoy a fantastic day meeting very special people! Looking forward to seeing everyone there. I'm excited to announce my appearance at this year's St. Marys, PA. Blue Angel 2017 Spring Holistic & Psychic Expo. Come and see your favorite gypsy and other amazing readers and vendors for a fun and enlightening weekend! Hosting this wonderful yearly event is Lily Dale trained: Rev. Charlene Schine certified medium. Mediums, Psychics, Healers, Vendors, Tarot Cards, Astrology, Spirit Writer, Paranormal Groups and much more. $5 admission fee (under 12 free) which includes free lectures and message gallery. Food, Raffles and Door Prizes too! Come join Greater Pittsburgh Pagan Pride Day for a fun two-day event! On Saturday, March 18, 2017 we will hold the annual Spirit Fair and Artisan Bazaar, from 11 AM until 5 PM at the Buffalo Inn in South Park. This is an all-handmade show, with local and non- local artisans! Fantastic readers will also be on hand to bring you clarity and guidance into your life. Your favorite gypsy Raven will be on hand offering tarot card psychic readings and vending some fantastic handcrafted magickal finery! Be sure to stop over to my booths and say hi! Sit for a reading , browse my products and have a great Spring time weekend in Pittsburgh! You can pre-book your reading with me or sign up at the event. I will be offering $45, 20 minute tarot card readings at this very special event. Come and see your favorite gypsy and other amazing readers and vendors for a weekend of fun and enlightenment. It will be hosted by Lily Dale trained: Rev. Charlene Schine certified medium. Come and see your favorite gypsy at this great event happening on April 11th & 12th at the Clarion Hotel in Falls Creek, PA . I will be offering very special tarot card readings for this event. They will start at $45.00 for 15 minutes. Longer readings will be available upon request. This event will feature Psychic Mediums, Tarot Readers, Reiki Healers, Spirit Writing, Aura Cameras, Past Life Readers and numerous vendors! Both days will feature a reading gallery. Everyone is welcome! ADMISSION is $5.00 and children under 12 get in for free. If you would like to book your reading with me for either of those days, please contact me through my web site. Medix Hotel Doe Day/ Girls Day Out! Come and check out local businesses as they make time for The Girls! Come and get pampered: Massage Therapist, Psychic Readings, Nails, Jewelry, Wine, Cupcakes, Adult Toys and Lingerie, Makeup, Candles, Scents, Wraps, etc. finish off the night with Karaokee OR make it even better and stay at the Medix Run Lodges with the girls. Raven Moon's Oracle at The Bavarian Fall Festival - St. Mary's , Pa. The Bavarian Fall Fest is a celebration of community in beautiful downtown St Marys, PA. . Come and celebrate the fall foliage and enjoy the entertainment. There will be plenty of shopping at the various food and craft vendor booths. There are also great local shops and places to stay. Enter the gypsy's caravan and explore all of my handmade, magical wares. Lusciously scented candles and handcrafted incense. Maybe just a little dose of magick to help an important endeavor...or perhaps you need the Gypsy to consult the spirits for a little universal guidance. Medix Run Rendezvous - Weedville, Pa.
Bring the family for the chain saw carver, black smith. antique tractors, horse back riding, jewelry & crafts, Straub tap takeover, band and Outhouse obstacle course. This is just a small sampling of what will be happening this weekend. On July 26th come see you favorite Gypsy at her booth at this very fun event! Christmas In July at Kreative Kreations - DuBois, Pa.
Stop by the store and browse the upstairs for Christmas goodies. This is a 3 day event! I'll be there with my VERY best All Natural Candles and Melts in all your favorite Holiday and Christmas luscious scents! Jack Frost, Winter Wonderland, Blue Spruce, Bay berry and so many more! As well as my soaps, incense, good luck charms and everything else you have come to know and love from Raven Moon's Oracle! Brushwood Folklore Center, LLC in Sherman, New York. See me here as I revive my spirit in a beautiful country side! I'll be offering readings and counsel for anyone who needs. Have a Blessed Summer, Lovelies! Tarot Readings at Kreative Kreations for Community Days! Kreative Kreations, 17 North Brady St., for Community Days on Friday and Saturday. June 13th & 14th. Join us on Saturday, June 14th, Starting at 4pm, as Raven will be offering Special introductory Tarot Card Readings for $10.00! Come and sit for a spell and let her give you some insight, guidance and fun! See why everyone is talking about Raven Moon's Oracle!